It's the same old story. Person only has her family—no friends. Person dies. Family eats person. While the above statement holds true for large parts of the South, it also happens just about everywhere there's a crazy cat lady. You know the type, she's a lady. She has cats. That's all you need to know about her. She's a crazy cat lady. The corpse of the crazy cat lady only gets discovered when neighbors notice cats adorably walking around the house wearing their former master's wigs and eating her ribbon candy (of course laced with large parts of intestine). While it might look insanely cute from the outside, it reeks of decomposed old woman on the inside. 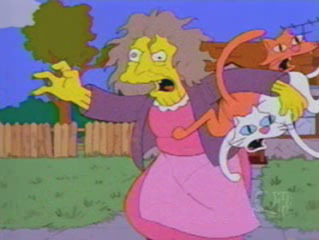 Or as we call it in the crazy cat lady industry call it, a push. My big question is why can only ladies be considered crazy cat ones? Is this some form of bizarre reverse sexism? There's no crazy cat men or insane iguana girls. The entire concept relies on a very pointed finger with only a certain type of person and a certain type of animal. You'd be crazy for these cats too... lady. I'm sure men out there would love to have a cat nuzzle up against them, tenderize their extremities and regale in their mews. As a guy, I can confirm that. And I'd love it even more if there were 34 of them. Yet society and its nomenclaturing dictates that I cannot do such a thing. Personally, I own three cats. Which many people would claim puts me on the way to CatLadyDom. I think it's just the exact amount of cats necessary for a household to function properly. My three cats have their own hierarchy worked out where Otis hates and beats up Sprocket, Sprocket doesn't care about Rio, and Rio just exists. Were I to add another, it'd be like adding dynamite to Rock-Paper-Scissors—would just screw everything up and make people angry enough at each other that they start attacking with real rock, paper, scissors or the oh so controversial dynamite. But with my three kids, there's no sort of dynamite kerfluffle. Everyone gets along in our own community. For a good while, I lived in a house with 500 square feet. This gave us all a good 100 square feet of space that was personally our own. Sure, occasionally those 100 feets overlapped while kitties would battle it out or I'd make them cuddle with me, but brought a welcome change to our loving relationships. And it was adorably cute. 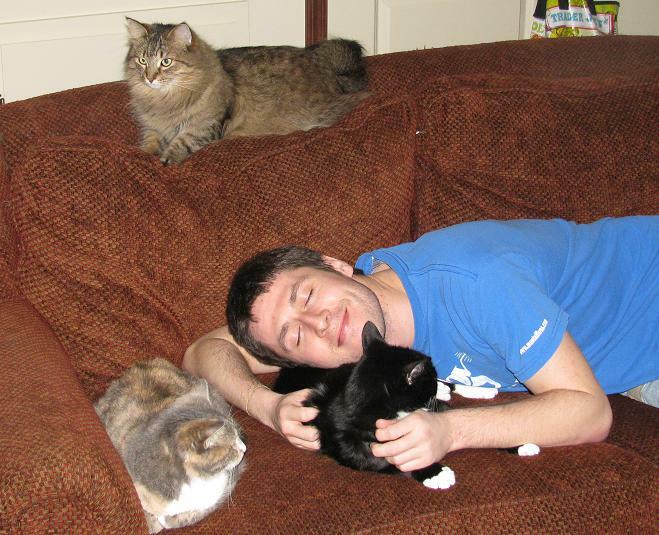 But then again, kitties were doing it, and I love my kitties. Even animated, those cats are still adorable! Come to think of it, my whole Rock-Paper-Scissors analogy is off. I need more kittens added to my masses. I'm in an apartment nearly twice the size now. Applying some permutations and purposefully incorrect math, I can easily fit at least a 50 cats in here—hell, I could even hop up to a gross of them. And the names I'd have for my new loves—Launchpad, Roderick, Pizza, Cheyenne, Television, Role Models on BluRay, Wyoming, Item. That just represents a small amount of the names I could go through for my brand new bundles of fur. All the kitties in the world will love me, much like the Grey Gardens people had adoring fur friends, or just about anyone who has ever appeared on Hoarders knows. There will be oodles of kitty love reciprocation. Who cares if they eat me once I pass, I know my 165 pounds will provide them with sustenance for years to come. They will lead happy, healthy lives because my corpse will always be there for them, much like they were there for me. Although the sight of our animals devouring my corpse just might confuse and sicken my girlfriend, I'm not going to let her stop it. I wouldn't let my Otis, my Rio or (most of all) my Sprocket suffer. I love them too much, and I will use my crazy cat man powers from beyond the grave to allow them sustenance.